› Wok-tossed chile crab bathed in a sweet, fiery sauce is a definitive dish of Singapore. Chomp Chomp Nation in Anaheim’s Wholesome Choice Market reimagines the finger-licking favorite as a hearty crab cake burger, flavored with ginger, kaffir lime, garlic, and a sweet, hot chili sauce. 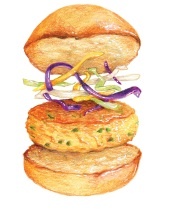 It’s topped with a handful of slaw and squeezed into a soft bun. 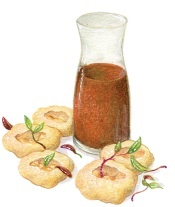 › Among India’s snacks is pani puri, little lentil puffs fried until they balloon to the size of golf balls. At Adya in the Anaheim Packing District, each is filled with a spiced chickpea mixture and accompanied by a cup of sweet-and-sour tamarind water. Pour a splash of it into the puri and eat it all in one blissful bite. 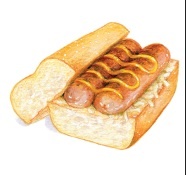 › The German links at Mattern Sausage and Deli in Orange make some of the finest sandwiches around. 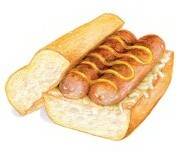 Try the bratwurst, butterflied and browned on the grill, then slathered with mustard and sauerkraut. Pair it with German potato salad for a perfect picnic-minded lunch. 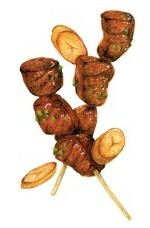 › In Peru, anticuchos are a street food staple: skewered meat cubes grilled until they recall equal parts kebob and Japanese robata. At Delicias Peruanas in Lake Forest, they’re threaded with hunks of beef heart, which not only look like grilled steak, but taste like it, too. Dab on a bit of spicy aji sauce for even more flavor. › Pizza is a square affair at Doppio Zero in Huntington Beach. The shop makes Roman-style pies—long, chewy, rectangular planks cut to order with scissors. The truffle porcini is a standout, as is the so-called “from Hell” pizza blanketed with sundried tomatoes and pickled jalapeños. Previous articleO.C. Condos: What does $2.9 million get you in San Clemente?